The Indian Air Force will induct its first C-17 Globemaster III, its largest strategic heavy lift aircraft, at the Hindan air force in Ghaziabad after it is procured from the US by 2013-14. 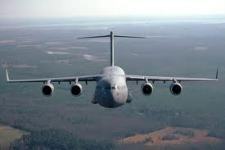 Recently India has formally cleared the biggest-ever Indo-US defence deal, the $4.1 billion (Rs 19,000-crore) contract for 10 C-17 Globemaster-III giant strategic airlift aircraft. The Boeing C-17 Globemaster will augment the IAF's inventory, which recently went up with the induction of the C130J Super Hercules transport aircraft from another U.S. company Lockheed Martin. These aircraft would allow the IAF to swiftly move a greater number of troops and materials than its existing transport fleet of AN-32 and Il-76 ‘Gajraj,' inducted more than two decades ago. A high-wing, 4-engine, T-tailed military-transport aircraft, the multi-service C-17 can carry large equipment, supplies and troops directly to small airfields in harsh terrain anywhere in the world day or night. The massive, sturdy, long-haul aircraft tackles distance, destination and heavy, oversized payloads in unpredictable conditions. It has delivered cargo in every worldwide operation since the 1990s. The C-17's ability to fly long distances and land in remote airfields in rough, land-locked regions make it a premier transporter for military, humanitarian and peacekeeping missions.The Globemaster is capable of carrying a maximum payload of 77.5 tonnes, including combat vehicles, artillery guns and battle-ready troops and will strengthen India's capabilities to rapidly move troops and equipment in its areas of interest. As it is capable of taking off and landing even on makeshift runways, barely 3,500-feet long and 90-feet wide, India will be able to transport soldiers and combat systems to forward areas both on western and eastern fronts much faster. Two years ago, India ordered eight long-range maritime patrol aircraft P8I at $2.1 billion, and there has already been talk of a follow-up order for four more aircraft. Boeing is developing the P8 Poseidon maritime patrol aircraft for the U.S. and has offered the Indian Navy a variant of it. These purchases are in addition to the CB105 Sensor Fuzed Weapons for the IAF ordered from Textron Defense Systems, valued at $380 million. Trials are under way for the purchase of 145 Ultra Light Howitzer Field Guns from the BEA Systems. There has been much criticism of the Defence Ministry's tendency to buy military hardware from the U.S. through the Foreign Military Sales route, instead of a multi-vendor bidding process. For Boeing, this Foreign Military Sale (government-to-government) establishes India as the C-17's largest international customer.